English as a Second Language, Curriculum and Instruction, M.Ed. A look into any public school classroom across the state or nation would reveal a variety of learners with specific needs. It is a common occurrence for a highly gifted English speaker, a special needs student, and students whose first languages may reflect Arabic, Burmese, Farsi, Kurdish, Somali, Spanish, and Swahili (to name a few) to be working together. The multi-lingual classroom is now typical instead of unique. The challenges posed by the classroom structures and populations require teachers to gain knowledge and understanding while developing expertise in the areas of second language acquisition, appropriate strategies and models for effective instruction, assessment tools and accommodations, and literacy frameworks, practices, and overall language learning. In addition, today’s classrooms require educators to become skillful examiners in order to conduct classroom action research that leads to improved practice and teacher efficacy. The M.Ed. in Curriculum and Instruction in English as a Second Language is delivered online. Daiva Berzinskas earned an M.Ed. in Curriculum and Instruction with Concentration and Licensure in English as a Second Language in 2009. “Before starting this program, I had worked as an ESL (English as a Second Language) instructor and IELTS (International English Language Testing System) coordinator at a private English language education company. Although I had plenty of experience teaching English, I was limited in job opportunities without licensure,” she recalls. She also says the program filled the void in her knowledge of pedagogy and made her much more effective as a teacher. “It taught me how to build an effective curriculum and ESL program for students and the community. Currently, I work as director of International Programs and ELL (English Language Learning) at The Webb School in Bell Buckle.” In addition, she works for The Lincoln Library of Essential Information, creating supplemental lesson plans for ELL students to use in core subjects, and also as a consultant for a private school in North Carolina, helping build an ELL program for its growing number of international students. She also has served on a bias review committee for TOEFL, Jr., with ETS, in Princeton, New Jersey. Ahmad Jeddeeni came to the United Stated from Damascus, Syria, under a political asylum program. He had been teaching Arabic to English-speaking personnel at the U.S. Embassy when it was attacked some years ago. U.S. personnel helped him escape, but he lost touch with his family for a while. In 2015, he graduated with a Master of Education in Curriculum and Instruction with an English as a Second Language (ESL) concentration. Now Jeddeeni credits his experiences at MTSU with his successes. “Right before I graduated, I received a job offer from Grand Valley State University where I currently work as a visiting Arabic professor. 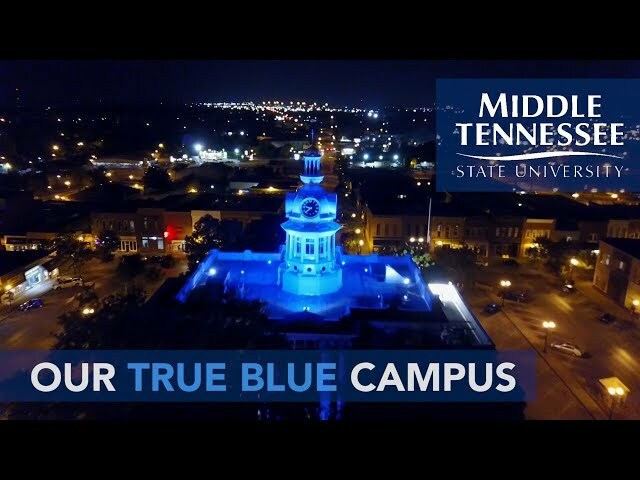 I am very grateful for the enriching experience I had during the two years I spent at MTSU. The M.Ed. degree that I earned not only helped me advance professionally, but it also provided me with essential academic tools to continue further studies and research in the language teaching field,” Jeddeeni says. The M.Ed. in Curriculum and Instruction with Concentration and Licensure in ESL offers preparation to candidates to teach in public schools, private schools, and faith-based learning environments. The program also seeks to prepare teachers to work with early learners who are also second language learners in preschool settings, nursery school settings, and early learning classrooms. Candidates who successfully complete the program meet requirements for the Pre-K through 12th grade professional license in ESL. This online licensure-based program, offered by the Womack Educational Leadership Department and leading to a Master’s of Education (M.Ed.) with a major in Curriculum and Instruction and a concentration in English as a Second Language is designed for: a) candidates seeking the master’s degree with Add-on Endorsement in ESL, b) candidates seeking the Initial Professional License in ESL, and c) candidates seeking the Add-On Endorsement in ESL (without degree). The M.Ed. in Curriculum and Instruction with concentration and licensure in ESL focuses on preparing professional educators to meet the needs of students who are currently enrolled in U.S. public school classrooms in grades PreK-12. These populations may include students who represent immigrant populations, newly arriving non-English speakers, children of immigrants, and diverse populations with a variety of language and learning needs. The program is designed specifically for teachers and those who plan to teach second language learners in multilingual classrooms within the U.S.
Coursework is aligned with the Tennessee Department of Education Professional Licensure Standards for ESL and the CAEP Standards and Professional Dispositions for public school educators. The program takes a literacy-based approach to teaching ELs and is grounded in state and national education initiatives. The program is revised on an ongoing basis to reflect current practice. This program is delivered online and does not prepare candidates to work exclusively with adult learners in EFL settings. A Master of Education (M.Ed.) with a major in Curriculum and Instruction is offered. The department also offers a major in Curriculum and Instruction leading to the Specialist in Education degree (Ed.S.) with a specialization in Culture, Cognition, and the Learning Process. Curriculum and Instruction, English as a Second Language Concentration, M.Ed. For admission into the master’s program, a satisfactory score on the Miller Analogies Test, the Graduate Record Examination, or the Praxis II (Principles of Learning and Teaching) or a valid Tennessee Teacher license is required. The Master of Education in Curriculum and Instruction with a concentration in English as a Second Language requires completion of 33 semester hours. No more than 30 percent of the total degree hours may be dually listed as undergraduate/graduate hours. hold an initial Tennessee teaching license. Non-licensure students must meet entry testing requirements for graduate studies (MAT or GRE score). Emphasizes the impact of history of education in terms of legislation and education initiatives which target and address the needs of second language learners in public school classrooms. Examination of action research processes as related and applied to practitioner-required and work-based settings. Design and implementation of an IRB-approved action research study related to a selected learning environment. Examines the impact of digital media and the current school-aged population of English language learners. Emphasis on language learning and instruction using a variety of online media, developing multiple literacies, and designing appropriate language and content instruction using appropriate web tools. Analysis of curriculum models for instruction in the EL classroom. Considers elements of differentiated instruction, transformative literacy frameworks, and standards-based content in lesson planning, embedded assessment tasks, and units plans with appropriate accommodations and adjustments for second language learners. Fieldwork required. Focus on specific theories and research pertaining to second language acquisition for the PreK-12 EL and regular education classroom teacher. Emphasis on cultural aspects that influence language acquisition, elements of language, sound systems, cognitive processes, and the psychology of language learning. Required for add-on endorsement in ESL. Examines the role of assessment in the education of linguistically diverse students in the PreK-12 classroom. Focus on formal and informal methods of assessing language proficiency, state and national testing initiatives, test preparation, and interpretation of test results. Fieldwork required. Prerequisite: YOED 6020. A field-based course for English as a Second Language teachers. Examines issues, professionalism, and challenges for working with ELs in public school classrooms. Emphasis on professional collaboration with mentors, community members, and ethnographic practices as a means for building advocacy and improving classroom situations for ELs. Analysis and application of strategies, instructional methods, and techniques appropriate for developing and implementing transformative literacy and standards-based content instruction for English learners in the classroom. Focus on state and nationally adopted models for addressing culture within integrated language and academic content lessons and unit plans. Fieldwork required. Focuses on meeting the varied needs of English learners within the regular education (non-ESL) classroom. Examines appropriate accommodations, curriculum adjustments, techniques for building academic language within content instruction, communicative group work, differentiation, and formative assessment strategies to identify needs to inform instruction. Emphasis placed on collaboration between the regular education teacher and the ESL professional. The Masters of Education in Curriculum and Instruction with a concentration in English as a Second Language (with initial license) requires completion of 33 semester hours and 9 hours of Directed Student Teaching. No more than 30 percent of the total degree hours may be dually listed as undergraduate/graduate hours. successfully complete a written comprehensive examination during the semester of graduation (exam may be retaken once during subsequent semester). hold an initial license for teaching in Tennessee. Candidates must complete 12 hours in the following course of study. The licensure coursework may be transferred to the full degree program. Please check with current catalog for program changes and updates. Students taking courses for licensure renewal, add-on endorsements, or "plus 30" upgrade on teacher licensure should register as non-degree-seeking students, Students enrolling in 6000-level courses must hold a bachelor's degree, and students enrolling in 7000-level courses must hold a master's degree. Non-degree-seeking students cannot register for 7000-level courses without departmental permission. Middle Tennessee State University offers the Add-on Endorsement in English as a Second Language, which is specifically designed to prepare initially-licensed teachers to work with English learners in public school classrooms. The Add-On Endorsement in ESL is an ONLINE program. All classes are delivered online through the Desire@Learn course management system. Requirements include successful completion of 12 hours of prescribed graduate classes, successful completion of the PRAXIS II / ESL Specialty Area Exam and the application for licensure (submitted to the Office of Professional Lab Experiences). To enroll in classes you must first apply as a non-degree seeking / licensure only student to MTSU Graduate Studies. All that is needed is your application and application fee. What is the cost of the program and is there any financial assistance available? Please visit the tuition website for more information regarding tuition and fees. This program is not an eCampus program. Please contact the MTSU Financial Aid Office to inquire about any funding that you may qualify for. When are the classes offered and how long will it take to complete the endorsement? Classes for the Add-On Endorsement in ESL are offered in Fall and Spring semesters. We are willing to work with schools and systems include additional offerings for possible cohorts. Please contact Dr. Craig at Dorothy.Craig@mtsu.edu for more information. See prescribed list of courses by viewing the Add-On Endorsement flyer. Can I apply to the program as an undergraduate? If you are currently enrolled in a teacher preparation program at the undergraduate level AND if you are in your last semester (Residency II), then you may apply to MTSU Graduate Studies as a non-degree seeking / licensure only student. Once you are admitted to Graduate Studies—you may begin taking classes. However, your initial license requirements must be met and the application submitted to the Tennessee Department of Education BEFORE you can submit your Add-On Endorsement application. This means that once you graduate with you B.S.—you may begin taking graduate classes but cannot submit the endorsement paperwork until you have completed all requirements and until you receive your Initial License. MTSU’s Masters with Concentration in ESL and Add-On Endorsement in English as a Second Language programs seek to prepare candidates who are have the skills, knowledge and dispositions that enable them to create welcoming, safe, and secure learning environments that encourage language acquisition, language use, literacy, and academic success within the today’s linguistically and culturally diverse classrooms. The program mission seeks to prepare knowledgeable professional educators who have the ability to meet the needs of second language learners including immigrant children, children of immigrants, refugees, asylum seekers, and lifelong English learners. In addition, the program’s mission is to equip a new teaching force with the skills and abilities needed to rise to the challenges posed by multilingual classrooms and to serve as advocates and community partners to assist English learners in becoming successful and productive members of our society. The program endeavors to support the mission and values of the College of Education and the university in continuing to serve as leaders in the preparation of educators across the state and nation. Seek out partnerships that support English learners and their families beyond the PreK-12 learning environment. Delivering a dynamic overall program that enables candidates to build skills, knowledge, and dispositions needed to be able to realize self-efficacy, promote literacy, and become lifelong advocates for second language learners. End of Each Semester: The program director conducts a thorough analysis of all qualitative data and completes a comparison of program data, program goals, alignment, and results from candidate assessments in order to identify any gaps, weaknesses, and/or revisions to coursework needed. End of Each Semester: The program director also conducts a systematic analysis of qualitative data using the constant comparative framework in order to identify patterns and themes that may inform the continuous improvement process. May-June: The program director conducts a comparative analysis of the program goals, targets, and student assessment results. An Action Plan for each target area not met is designed and implemented. If available—alumni data are evaluated, compared, and integrated into revisions to curriculum. July-August: Revisions and adjustments are completed based on data analyses and results. The implementation of Action Plans begins with the start of the new academic year and the process continues in a cyclical manner. Candidates for licensure must complete fieldwork related to assignments in each of the ESL Concentration courses. In addition, to meet the requirement for field-based experience—all candidates complete SPSE 6712: Fieldwork and Professional Collaboration in ESL Classrooms. This course is required for the following programs and meets the requirement for Residency I for Initial Licensure.